If you would like to learn about goat keeping our three goats will teach you, here in Kilchoan on Saturday 13th September 2014. This one day course has been organised by West Highland College, part of UHI (University of the Highlands and Islands). At the end of the day the goats, with some help from me, will have taught you about, breeding, feeding, health, handling, welfare, behaviour and overall management. This will equip you to start keep goats mainly for milk but also meat and fibre production. One of the best light meals in France is green salad with "chevre chaud". The chevre is a small round soft cheese with a grey wrinkled rind a bit like a brain. As its my favourite cheese I made some today. Sanitise all of the tools and pieces of kit in a chlorine bath, I use Milton tablets one to five litres of water. Put the utensils back in the bath after use. Take ten litres ( two gallons) of goat's milk and pasteurise it. Soft cheese is a great medium for mould and bacterial growth! Heat it slowly to 72C in a double boiler, the cheese bucket inside the jam pan. Once it gets to 72 hold that temperature for 15 seconds then plunge the bucket into a sink with cold running water to get the temperature down to 32C (inoculation temperature) as fast as possible. This is artisan cheese making in the kitchen so the measurements have to fit the kit available. Add an eighth of a teaspoon of mesophilic culture then the same amount of Geotrichum candidum, stir then leave to ripen for an hour. Dilute your rennet (instructions on the label) and dilute in a quarter cup of water add to the milk and stir for a minute.Allow to coagulate for an hour. Its ready when your finger moved up through the surface leaves a clean break in the curd. Cut the curd with a sterilised bread knife with passes half an inch apart and full depth of the curd. If you don't have a curd knife to cut horizontally cut at an angle with the bread knife. With clean hands stir gently three times over ten minutes then allow the curds to rest for ten minutes. Ladle the whey off the top into the crottin moulds. You can make these from yoghurt pots punctures with a hot wire or needle. Fill the moulds to the top because it shrinks dramatically. Stand the moulds over a roasting tin on a wire cooling tray. After half an hour turn the moulds over, slide the contents out on to a plate or saucer then pop the cheese back in upside down. Do this two three time more before leaving to drain until tomorrow morning. Next morning the cheeses should have shrunk to a third of their original volume. Slide the cheeses out of their moulds and put them in a pan of saturated brine for 20 mins. After brining put the cheeses back on the wire tray to dry for two hours. Every May and June there are few days when the "Ben" is clear of cloud, its windless hot and sunny. On Sunday night the forecast was perfect, it was my week off from milking goats and I needed some exercise. Several hundred others thought the same. The view from the summit (1,303m ) has to be Britain's finest mountain panorama. As highest in the range and Britain all of the other peaks are below you. Free image downloaded from the internet. I told you my camera was crap. 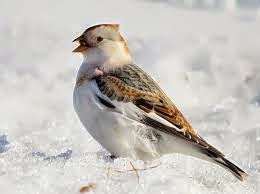 noticed the snow buntings flitting around the summit snowfield . When I pointed them out no one was really interested just a polite smile as if to say, "so what"? One of Britain's rarest breeding birds, that's what! People were still heading up at six in the evening when I was down to the Glen Nevis path they wouldn't be on top until after 10 pm.